Book online and receive 5 points per person booked. 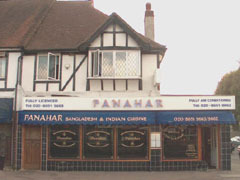 One of the best presented Indian restaurants in the South of England, Panahar offers a cuisine made famous by the Mogul empire. Now this style of cooking is available for you to enjoy. The restaurant is tastefully decorated, with private dining and a very attractive bar area to enjoy a drink whilst you browse the menu. Panahar offers live music every Sunday, Tuesday and Thursday. Uniquely Panahar boasts providing lunch for all 26 London mayors. Open every day 12-2.30pm and 6-11pm. All major credit cards accepted (not Diners). No service charge. Sunday buffet 12 noon onwards for £7.95. Bangladeshi and Indian cuisine served in tasteful surroundings. The Indian cuisine is as diverse as its culture, languages and regions The staples of Indian cuisine are rice, atta (a special type of whole-wheat flour) and at least five dozen varieties of pulses. The subtle blend of particular spices such as Coriander, Cumin, Fenugreek, Asafoetida etc., give Indian food its distinct flavor.